It's our favorite childhood memory: a whiff of chocolate chip cookies baking in the oven. These treats taste equally great but are loaded with muscle-building protein! Nothing complements a glass of milk like a cookie. If you're watching your waistline but still crave dessert or a late-night treat, try recipes that cut back on carbs and fat and amp up the muscle-building goodness. Delicious and good for you? That's the way these cookies crumble. I used Lean Body for Her Whey Protein Isolate in Natural Vanilla, but any whey protein blend will work. For the butter, I typically use Smart Balance, but you can substitute butter, ghee, or any buttery spread suitable for baking. I think we can agree chocolate and peanut butter are a match made in heaven, right? Well, these cookies taste heaven-sent: surprising, because I kind of threw this recipe together! It's not often that things come out perfect on the first try. These cookies are thick and chewy, with a crunchy outside and gooey chocolate chips inside. It took all my willpower not to eat them all at once! If you love a crunchy, chewy cookie, these peanut butter oatmeal cookies are for you! The flavor strikes the right balance of sweet and salty without being too rich. Not to mention, six of these crave-worthy cookies total just over 300 calories, and they're high in protein and low in fat—perfect for a post-workout snack. The peanut butter flavor is a nice complement to the oats, but you can substitute almond butter, cashew butter, or sunflower seed butter instead. 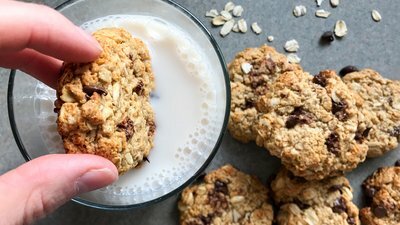 My favorite way to enjoy these cookies is dunked in a glass of cold almond milk. Yum! A sugar-free sugar cookie: sounds like an oxymoron, right? Believe it or not, these cookies each contain just 1 gram of sugar, 80 calories and 3 grams of net carbs—but 5 grams of protein! These aren't exactly "low fat" at just under 5 grams per cookie, but then again, no one should subsist on cookies alone. Even if you're on a strict diet, two or three of these "healthified" sugar cookies won't blow your nutrition. Did I mention they're soft, with just the right amount of "bite," and that the frosting is to die for?